I've been wondering this a lot lately and haven't been able to get a straight answer. If a parabola has real roots and then the function is altered to set limits so that x cannot equal those roots what is the relationship between the new imaginary roots and the old real roots? This picture may illustrate it better. I haven't been able to construct a proper function to resemble the 2nd picture (besides using square root tricks with my calculator), so I have no way of solving for the imaginary roots of the 2nd function. Would their be some sort of constant relationship between them? I've been very curious about this, but I'm not too sure how to get it across. Perhaps the idea is impossible? As for your question about the relationship between complex and real solutions, I don't see what kind of relationship you were expecting? The only thing they have in common is the fact that for some values of the parameters a, b and c the condition f(x) = 0 is true! 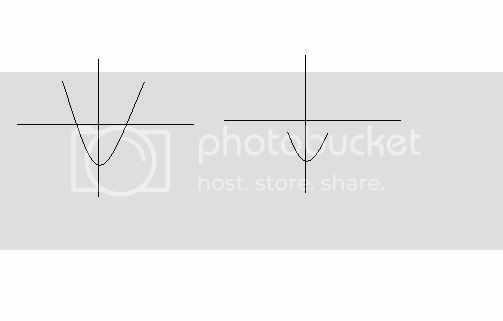 When roots are complex, the parabola doesn't reach the x-axis. If the leading coefficient is positive, it lies entirely above, and if negative, it lies entirely below. I'm aware of this. And I didn't mean cut off a parabola. If only I had a more tangible way of explaining myself. I meant if you were to find a separate function that is the equivalent of the original function but x is undefined instead of 0. I was just using a parabola as an example. I understand that limits is a really poor choice of wording, I meant finding a completely separate function altogether. Perhaps I expressed myself a bit better there? But if you make the part of the parabola undefined, and on that part you had your root's, new root's will not emerge! You will have a function with no roots.. Is this what you mean?! Yes, that is what I mean? So the question does not work I imagine. I simply assumed that the expansion of the function to have these roots undefined would take a completely different form (something very very strange and messy). I guess it would be undefined in both the real and imaginary world? That makes sense. oh! That's where you miss me. I don't mean literal limits, I mean a new function in general. I'm going to sound very colloquial here, but I don't know much math "dialect." let t and v be left and right limits, respectfully. Technically the functions are the same but if you graph the second function as it is, it will provide limits. I know there are ways to rearrange these into a less messy format, and from there you have a function almost identical to the first except x is undefined past the limits. If this is true, there are imaginary roots, yes? I wish I knew more about math so I could explain this better. The most I know about undefined values within functions is fiddling around with my calculator, so I don't know much about known function formats that have limits :\. The problem you have encountered is the fact that your calculator is not capable of figuring out that the square root parts can be canceled out, but tries to plug in some values and when he get's a complex number, he ignores it. Again, if you try to solve your function, YOU (unlike your calculator) will cancel out the square root parts and will get the same roots you got for your first function. In fact, as you've written your function down, the root''s you get WILL be the roots of your equation, since you are smart enough, and, once again, will cancel the square root parts after plugging in the roots you calculated. I would just like to add that what you are trying to do is to "cheat" math.. Unfortunately, trust me when I say - math will prevail! But, never the less, you may learn something from this, and that is good enough..